In a town of just over 7,000 residents (double if you count the outlying area), it's hard to find one person who has anything bad to say about their former mayor. As the current Governor of Alaska, and Vice Presidential nominee for the Republican Party ticket, Sarah Palin still lives in tiny Wasilla, AK - driving herself to and from work and still yelling support at her kids' hockey games. Every business owner (and MerchantCircle members) I spoke to in Wasilla has met Gov. 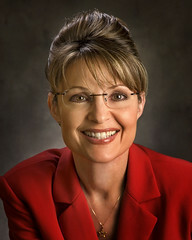 Palin and many count her as a friend. "She's awesome. I know her personally, so you may call me biased, but she's just real down-to-earth," says Denise Rexford, owner of Stampin Moose. "We'd like to keep her as the Governor of Alaska, but she can better the state of the entire country." As the mayor of Wasilla, Governor Palin developed a reputation for reducing spending and cutting taxes. During her speech at the Republican National Convention, Becky Raterree of Northen Mist Gifts pointed out Governor Palin's 'shout out' to small business owners. "I like the fact that she mentioned her sister and brother-in-law both own a small business. One thing she could do is make sure that the tax issue is kept in line for small business owners. It would be nice if taxes are cut, but it just needs to stay the same," says Raterree. Wasilla boasts one of the largest number of MerchantCircle members per capita. Even with 236 members, we had to travel outside of Wasilla to find someone who wouldn't vote for Governor Palin on the Republican ticket. "I didn't vote for her for Governor, but I think she's done a good job," says Mark Boberick of Polar Breeze Bandanas in Fairbanks, AK. "I won't vote for her on the McCain ticket, because I'm firmly opposed to her abortion stance and I don't think she's prepared or has enough national experience for the job." Still, whether Gov. Palin is elected or not, Boberick would like to see more information readily available to small business owners when it comes to programs and benefits. "I had to find out a lot of the information on my own, by attending meetings from non-government agencies," say Boberick. "These programs can really help out struggling small businesses." No matter what your political affiliation, almost all Alaskans and Wasillians are proud of their Governor, neighbor, and friend. "I think we need an 'average Joe' in Washington," says Rexford. "As Governor and mayor, she's watched her money, stuck to her guns, and didn't break her promises. If she says she's going to do it, she'll do it. And we'll be behind her every step of the way." The Republican Party has been high-jacked by the religious right as McCain’s selection of Palin proves. I thought McCain might bring some sanity to back to the party but it turns out experience does count and he is following the George Bush/Carl Rove play book of appealing to the "Gun tottin, God fearin" mob with his choice of Sarah Palin. The least you can say for George Bush is that he picked Cheney, whatever you may think of him, he is no light weight. Another trait about McCain that makes me very uncomfortable is his quick shoot from the hip decision making process. His selection of Palin seems to be a perfect example of this. This seems very similar to George W. Bush's decision making methodology which landed us in $3 Trillion and counting war without end. And I'm not a democrat. I voted for Bush the first go around. But McCain just doesn't seem to have the necessary personality traits to be an effective executive. He lost my potential vote for good with his selection of Palin. After a mediocre (at best) acceptance speech I still don't know who she is. She wasn't properly vetted and when the dirt on her hit the press everyone wanted to blame Obama and his supporters. And talking about keeping kids out of politics...Conservatives should practice what they preach! This woman has become more popular in less than a week than Obama and McCain. What does that say about the American People?...wow...People are raving about how much they love her, her kids, even her parents who, as far as I know...have only been shown once...in the audience at the RNC...What is going on?